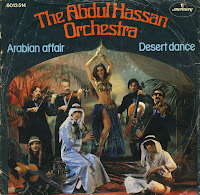 'Arabian affair' sounds a bit Middle Eastern, but in fact it was made by a Dutch group. Behind the scenes, Dutch musician and producer Hans van Eijck was experimenting with Eastern melodies, combined with disco beats for the fun of it. He enlisted some session musicians to create the single 'Arabian affair', which became a big hit in the Netherlands: the single reached number 4 in the Dutch Top 40. When the success crossed over to Germany, the project turned out to be lucrative enough to warrant a complete album, which you can find here.